With the support of a specialized medical team and dedicated family, 7-year-old Ki’Mani Yancey is able to live up to his name just about every day. Ki’Mani is an avid reader. He loves books about animals and dinosaurs and hopes to be a paleontologist one day. He is in 2nd grade but reads on a 7th grade level. Ki’Mani has hemophilia, a disease that prevents his blood from clotting properly. Individuals with hemophilia do not bleed any faster than those without a bleeding disorder, but the bleeding is prolonged. Generally, minor cuts and scrapes do not cause any problems, and most bleeding associated with hemophilia is not life-threatening, but bleeding in certain places in the body – especially internally – can be very dangerous. For babies and toddlers with this condition, the most common sites of bleeding are the mouth and in the muscles and soft tissue under the skin (bruising). Older children and adults often have bleeding into joints, especially the knees, ankles and elbows, which can sometimes even occur spontaneously. Hemophilia is a genetic disorder that can affect many generations of a family. 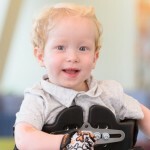 Ki’Mani was tested at birth, as he has a family member with the condition, and since the first days of his life he and his family have worked closely with his medical team at CHoR’s Central Virginia Center for Coagulation Disorders’ Hemophilia Treatment Center at VCU. This comprehensive hemophilia clinic is one of 140 federally funded hemophilia treatment centers nationwide. There are just three in Virginia, and Ki’Mani and his family travel an hour from their Lawrenceville, Va., home for this specialized program. Cases of hemophilia can be mild, moderate or severe. Ki’Mani has severe hemophilia A, which means his body makes less than one percent of a protein in the blood that strengthens clots (specifically “clotting factor VIII”) putting him at a higher risk of bleeding problems occurring often. To treat or prevent bleeding, Ki’Mani is given a concentrated amount of the missing clotting factor. The clotting “factor concentrate” is infused directly into the blood. At a young age, this is given intravenously at a medical facility until a parent or the patient learns how to do infusions at home. Ki’Mani had received factor concentrate a few times in his first year of life to treat bleeds. This exposure triggered his immune system to develop antibodies. “Because patients with severe hemophilia basically do not make any factor VIII, their immune system responds to the factor concentrate that they receive when treated for bleeds,” Jan Kuhn, a hemophilia clinic nurse who has worked with Ki’Mani for several years, explains. Infusing larger amounts of the clotting factor over time so the body begins to recognize it, rather than attack it, can help overcome inhibitors. Because Ki’Mani was so young and his veins were small, he had a medical delivery device (a port) surgically placed in his chest so he could receive daily infusions. A nurse came to the Yancey’s home for about three months to give the infusions and provide training for Maricia. Once she was comfortable, Maricia began giving him the daily infusions at home and Ki’Mani’s response to the treatment was “excellent,” according to Jan. Within months, they were able to reduce his infusions to three times a week. Ki’Mani comes to the hemophilia clinic about every six months for checkups. The clinic’s team includes a pediatric hematologist, nurse coordinator, educational consultant, nutritionist, physical therapist, social worker and genetics counselor. “Each of these disciplines does an assessment and plan of care with the patient and family,” Jan explains. Recent advances in hemophilia care include gene therapy to treat the disease and longer-acting factor concentrates. Patients are offered access to clinical research studies and trials as appropriate. The clinic team also works closely with the Virginia Hemophilia Foundation to provide additional assistance through group support and educational programs, as well as help with transportation costs, medic alert bracelets and financial emergencies for families. In addition to the one-on-one care Ki’mani has received throughout his medical journey, one of the things Maricia says she likes best about CHoR is the overall approach being “very family oriented,” which is something that’s helped their family even more in recent years as Ki’Mani’s youngest brother, Julian, was also diagnosed with hemophilia. 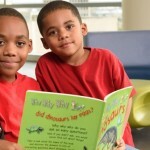 And perhaps, most importantly, is that Ki’Mani – who hopes to be a paleontologist someday – is a great example for his brother of how not to lose your adventurous spirit, despite living with serious medical challenges. The “Meet our Calendar Kids” blog series highlights children featured in CHoR’s Tid*Bits calendar. Join our mailing list to receive future issues of the Tid*Bits calendar and newsletters. We hope you’ve enjoyed getting to know Ki’Mani, our featured patient for March 2017.